- Shop for the classiest engagement rings online from the privacy of your own home. It has been a good few months since i've installed my EC widget. 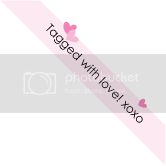 What I like about this widget is that I can have pretty & elegant avatar in my blog, as well as meeting new friends. It is a great pleasure to drops and get drops from my EC friends. Here are my Top 5 droppers for July 2008: Marzie, Brittany, Emila, LJ and Genie Princess. Congratulations, ladies!! Group Hugs!! p/s: To all my recipients, please give me your email add that you've used in EC. You can either drop me a comment or email me here. Thanks! Join me in the below conversations, if you like! Hello peeps! Chloe is here to cheer you up again! These photos were taken when she was just a few months after her 1st birthday. She simply love laughing. What Scrapbooking Elements Are You? Vhiel, the creative blogger i mentioned in my Linkies Love 1 has just tagged me to do this quiz. 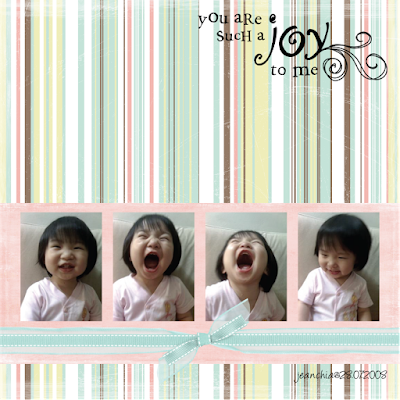 It is finding out What Scrapbooking Elements Are You? Fun and crazy at times. You are a warm fuzzy kind of person. You run around getting things done but still find time for fun! You have so many diverse interests that it is often hard to pin you down to any one thing. People love your friendly attitude and carefree ways. You often brighten other people's days. But Fibers Beware - Sometimes people don't take you seriously because of your happy-go-lucky ways. Sometimes you find yourself feeling left out from decision making that could directly affect you. Even though you like to be happy and cheerful, make sure others know that you can also be serious and in tune with reality. THE SCRAPAHOLIC ME - Stickers Because Life Is Fun - Paper Quicker8- paper Just Me.. Eds - Glue Anything and Everything in Between - Paper A Great Pleasure - Fibers Emila - Paper Craft & Swap - Paper What scrapbooking item are you? Yay! I've finally make my move to start doing digital scrap booking. I've been envyingly admiring other's digiscraps for quite some time now and have been wanting to try my hand on it. After seeing Emila starting on digiscrap as well, i was even more eager to start. Hence I started my own research and compiled my scrap stuffs. Elements were downloaded from Shabby Shoppe. This is something I've learned from Bobby. We must know how to give and not expect anything in return. So, here I am with my Linkies Love #1. DeCaFFeiNaTeD - Chronicles of a Milk Drinking Diva. About a young girl named Chesteney who love painting, sketching, writing stories, composing songs, dancing ballet, modeling, singing and performing on stage. Vhiel is a creative and innovative blogger. Her site is about contest, giveaways and her daily life. Currently, she's hosting a contest "Search For The Cutie Child" and the voting has begun. If you wanna vote for these cute babies, please visit her site. Voting ends at 31st July. ok, so we all know emila as the great illustrator. Her talent is undeniable impressive. But do you also know that she has a hidden talent? Yup, that's right! Find out all about her hidden talent in photography at The other side of emila. The author is an adorable shih tzu named Sushi. His first post revealed the purpose of this blog, read all about it here. He's really friendly, thoughtful, sweet and smart. 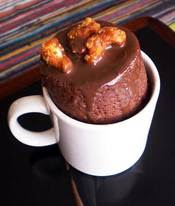 I love his recent recipe: Quick & Easy Mug Cake. It's really easy to make & is yummy~licious!! Nina aka charm enjoy her life being a mother and wife. Nothing in this world is more precious than her family. Look out for her cuties cause they are really cute. Recently she was being nominated as the Idol Blog '08 for week 3. Voting is still going on, please vote for her here. Taadaa!! Presenting to you my first ever baked cake! :) I've made this butter marble cake last weekend. Yes, this is my first time baking a cake. I was pretty excited during the process and am happy that it came out looking good. But I gotta admit that the cake was nothing to shout about. There's no butter smell to it, because i used a normal butter. Since this is a butter marble cake, a good quality butter is the key to this cake. And secondly, the cake was alittle bit dry after a while. It was only good when eaten warm when it is still moist. 1. Preheat oven to 175°C. Line a 20cm cake tin with greaseproof paper. 2. Cream butter with sugar until light & creamy. Add egg yolks one at a time & beat until light & fluffy. Add essence & lemond rind, blend well. 3. Fold in flour gradually & mix well. 4. Whisk egg whites & sugar until stiff. Fold merigue into the flour mixture gently. 5. Melt chocolate bar in microwave under medium high for 1 min. Add in cocoa powder and 1/3 of the prepared batter. Mix well. 6. Randomly put spponful of vanilla batter & chocolate batter in the prepared cake tin. Level up mixture at the sides but allow a shallow well in the center. This enables the cake to level up evenly during baking. Use a toothpick to make circular pattern on the surface of the batter. 7. Bake in preheated oven for 55-60 mins, or until cooked. Disclaimer: Modified from Amy Beh's recipe: Butter Cake. Liza from My So-called Life has tagged me on this meme. Even tho' it's a long questinaire but it's worth the time. It has got all the questions you need to know about someone. 1. Add your blog/s to the list. Feel free to add all your other blogs. It’s okay if you only post this questions in one blog as long as you answer them. 2. Get back to YEN and will add your blogs to the master’s list here! Yup, another linking thingy but this one has 15 questions and you get to enjoy answering them too! 3. Tag as many friends online you know. But you don’t need to be tag in order to join. 1. When you buy a greetings card, are the words or the picture more important to you? 2. What’s your favorite kind of cake? 4. What’s your favorite holiday? Chinese New Year & Christmas. 5. Are you going on holiday this year? I dont have The Best Party. As long as I am with my darling and my good bunch of friends or my families, any party is great. Well, we would love to have a church wedding followed by a lunch buffet at pool side. But knowing that the lunch buffet is impossible, we hv to replace the idea wt the usual wedding luncheon at some fancy hotel. My darling & I had discussed about the lunch buffet. Even tho' wedding is about the both of us, we must also care about our relatives' feelings. Buffet will be too tiring, especially for the elders. 9. What’s your favorite girl’s name? Chloe. Which I've already given to my niece. 10. What’s your favorite boy’s name? Can't think of any now. Random picked from the bible: Elisha. 11. Which celebrity would you like a dream date with? Right now? 14. What is your best character trait? 15. What is your worst habit? According to the 3rd rules above, i do not need to tag in order to join this meme. So, with the permission from the meme creator, YEN, i shall pass the tagging part. ^^ But if you wanna join this meme, please let me know after you've done it, I'll be happy to add you in my list. After brainstorming for nights on how and what should I do in return for those chefs who has shared their recipes with us, I came out with these lovely buttons. 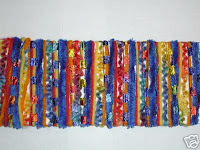 It came in two patterns; "View My Recipe @ AGP" and "My Recipe is featured @ AGP"; and four colours; pink, blue, purple and green. First "sift" the egg through the sieve and into the mug. Beat well with the fork. Add oil, milk, sugar and cocoa powder and beat more until blended. Add flour, baking powder and beat gently until fully incorporated. You'll have a more liquid batter than a normal cake but, don't worry! Don't add any more flour otherwise you'll have a heavy cake. We don't want that! Now, microwave on full power for 3 minutes and voila! You're about to enjoy a quick, easy and yet D-E-L-I-C-I-O-U-S individual sized cake. -The mug should be a 300 ml one. Just add this purple widget at your blog, and Caring.com will contribute $10 to the Alzheimer's Association. It can be personalized with a loved one’s name and comes in different shades and sizes to help match your blog. Come on and let's create one for your blog too! Do you know that individuals who are over 65 years old are commonly afflicted with Alzheimer disease? Each individual experiences the symptoms of Alzheimer's disease in different ways. The common recognized symptom is memory loss. Often this symptom is mistaken as a form of stress. As the disease advances, other symptoms such as confusions, angers, mood-swings and language breakdown will surfaced. Many preventive measures have been suggested for Alzheimer's disease, the often recommended are mental stimulation, exercise and balanced diet. But there is no certain guaranteed cure for Alzheimer's disease yet. I would like to encourage all my US visitors to join Alzheimer's Memory Walk. It is the nation's largest event to raise awareness and funds for Alzheimer care, support and research and it calls on volunteers of all ages to become champions in the fight against Alzheimer's. 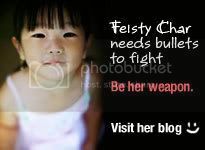 We can really make a differences in lives of those who are affected with this disease. Together we can walk for a purpose! Before I get started on my award post, i would like to give a special shout to Marzie from Mariuca's Perfume Gallery for giving me a chance to win in her recent Where's Mariuca? Contest. Now back to my award post, here's an aromatic Strong Cup Of Coffee Award from Mommyallehs and Colored Heart. Thank you, ladies!! 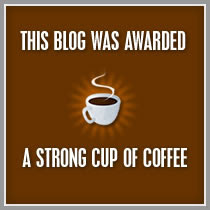 :) According to Mommyallehs; "This is an award for my fellow bloggers: A medal for their mad about blogging." Marzie, Janice, Emila, Bobby, Adrian, Nick, LadyJava, Sandman, NafaSG, FL Sam, Karen, Trinity, Liza, Abby, Emmy,Ratu Syura, Pia, Mr. Zubli, LadyBanana, Lee Chien, Bro Bokjae, Jackie, Shemah, Sabrina, Sasha, Sushi, Rozella, ECL, Debbie,Nina, Vhiel and Cecile. If you're not a member of dNeero, click here to join first. It has been almost 2 months since the fuel hikes, how are you adapting to it? Come and join me in the conversation below. 1. Drain lychee, reserving 170ml of syrup. Blend lychee, syrup & lemon juice into puree. Pour into a steel tray and freeze for about 1 hour, until mixture is slushy. 2. Whisk egg whites until stiff. 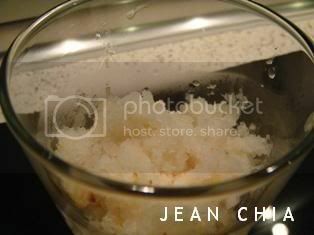 Fold in semifrozen lychee mixture and blend again. Freeze for about 45 minutes, and blend again. Freeze until firm. Note: If you don't have steel tray, you can use a plastic container instead. But please note that the freeze time will vary, approx. 2 hours for the first time freezing and 1 1/2 hour for the second time freezing. p/s: Sorbet had been only blended once in the above picture. That is why you can see the coarsely shaped ice. Get Paid To Promote At Any Location! >>> Twice monthly auto pay by paypal! >>> Minimum Payments is $ 0.1 Sign up! Taken on 4th FEB 07.